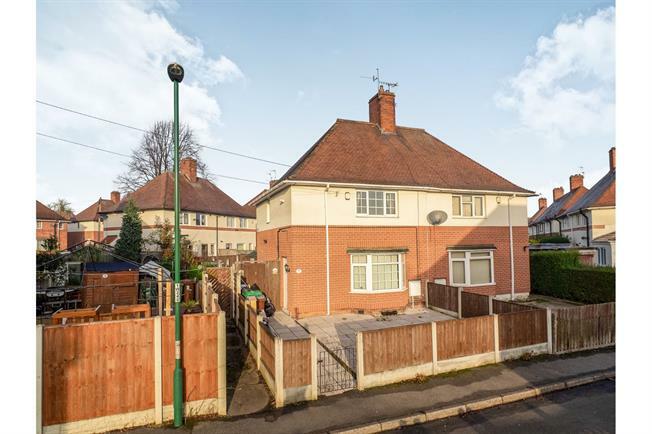 2 Bedroom Semi Detached House For Sale in Nottingham for Offers Over £90,000. SOLD WITH NO UPWARD CHAIN Three bedroom semi detached house is in a quiet and popular cul-de-sac location and would be ideal for any first time buyer looking to get on the property ladder. The property is well presented throughout and briefly comprises of a; entrance porch, lounge and kitchen/breakfast area which leads out to the rear. To the first floor are two double bedrooms and a family bathroom. Outside the property to the front is a drive for off street parking. To the rear is the garden which is block paved for low maintenance and also allows access to the front. A viewing is highly recommended so please call today.